triethyl phosphate production process - ZhangJia Gang YaRui Chemical Co., Ltd.
① Preparation of diethyl chlorophosphate: after mixing phosphorus trichloride and toluene, stir and add the absolute ethyl alcohol, control the humidity at 30-40 ℃. After addition, continue to stir for 0.5h, and generate diethyl phosphite. Then drop thionyl chloride, control the humidity at 30-40 ℃, remove the redundant thionyl chloride under reduced pressure , and the residue is diethyl chlorophosphate. ② Preparation of triethyl phosphate: add the alcohol solution of sodium ethylate into reactor, and drop the diethyl chlorophosphate under stirring. Control the humidity below 70 ℃, mediate the pH to 7-8 by sodium ethylate and acetic acid, after adding ,stir for 4h, then add cold water, and mix them. And then add toluene and continue to stir for some time, standing for layer. 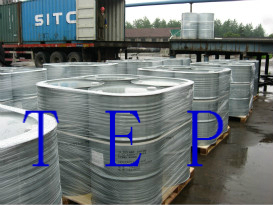 Extract the upper oil, and dry it by anhydrous carbonate, recover toluene after filtering, and then carry out vacuum distillation, collecting the 72-88 ℃ / 0.4 -0.667MPa product, which is finished products. （2）Take phosphorus oxychloride and ethanol as the raw materials, synthesize in two esterification method steps: add 100mL (1.07mol) phosphorus oxychloride into the 250mL four-necked flask with a stirrer, and cool it with ice brine to below 15 ℃, then drop 92mL (1.60mol) ethanol under vacuum. In another 1000mL four-neck flask with stirrer, add 550mL (9.63mol) ethanol. add the above products under normal pressure, and cool them with ice brine to ensure that the reaction humidity is below 15 ℃. Ethanol recovers the reaction mixture under a high vacuum of 0.098MPa. Control the distilling humidity less than 55 ℃. Apply the recovered ethanol to the esterification 2, and then neutralize the remaining product with lye to a pH of 6-7, extract and distil again to obtain the 165.05g finished product. Process parameters: phosphorus oxychloride : ethanol = 1:9 (mol), the reaction humidity is 15 ℃, reaction time is1.5h; and product yield is about 82%. （3）Preparation of diethyl chlorophosphate: after mixing phosphorus trichloride and toluene, stir and add the absolute ethyl alcohol, control the humidity at 30-40 ℃. After addition, continue to stir for 0.5h, and generate diethyl phosphite. Then drop thionyl chloride, control the humidity at 30-40 ℃, remove the redundant thionyl chloride under reduced pressure , and the residue is diethyl chlorophosphate. （4）Preparation of triethyl phosphate: add the alcohol solution of sodium ethylate into reactor, and drop the diethyl chlorophosphate under stirring. Control the humidity below 70 ℃, mediate the pH to 7-8 by sodium ethylate and acetic acid, after adding ,stir for 4h, then add cold water, and mix them. And then add toluene and continue to stir for some time, standing for layer. Extract the upper oil, and dry it by anhydrous carbonate, recover toluene after filtering, and then carry out vacuum distillation, collecting the 72-88 ℃ / 0.4 -0.667MPa product, which is finished products . These are the process details of triethyl phosphate, and if you want to learn more information, please contact us! If Triethyl phosphate production process product is not what you want, we can be customized according to your needs, please send us your order to Email: sales@yaruichem.com , or click here to post your buying lead.